Fantastic back-of-napkin assessment tool. Such tools are evidence of hard-won synthesis of vast quantities of previously incomprehensible data. Having studied chemical engineering I know that there will be more of these tools that enable quick decisions and save entrepreneurs lifetimes of pain. I wonder if pain + competition or pain*competition have to be some constant. In other words, one key element of pain is the lack of a good competitive alternative. 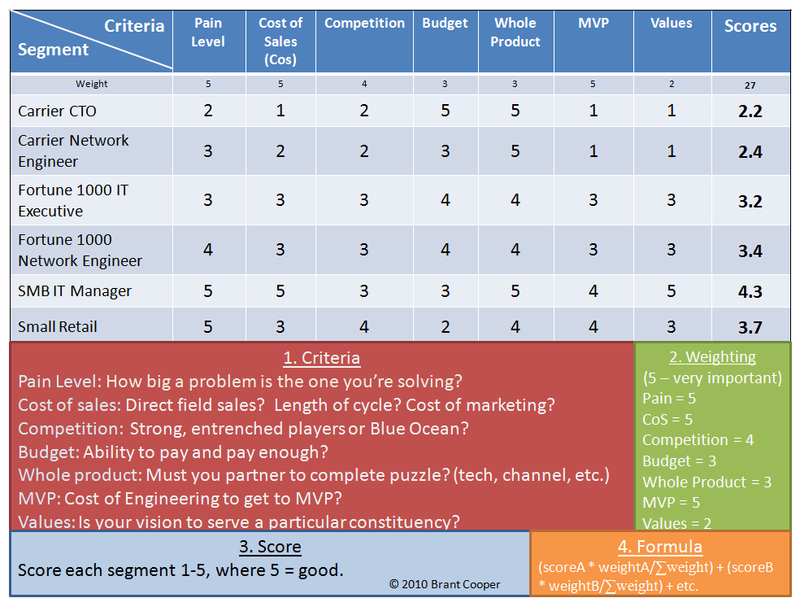 Also would it make sense to first sort by degree of MVP, then degree of whole product, for all segments above some pain threshold (or below a competitive threshold. This might be the “fastest path to revenue” even though in the long run it might be a less desirable segment, it might be one to target just to get to break even. I like this “marketing by the numbers” approach to mapping the possibility set. Thanks for the comment, Sean. I’m sure you’re right about the relationship between pain and competition, but I’m not sure there’s a downside to keeping them separate. One audience may have a mild pain that is not addressed by competition at all (don’t target that segment); one audience might have a severe pain one component of which is addressed well. I think the columns can vary by company, so I was throwing out some examples people might want to think of. Have you tried anything that used dollars rather than ordinal scale? I suppose you could, but dollars can also be used when determining scale. Obviously, all your columns need to be expressible in dollars. Also, you have to be careful that you’re comparing apples to apples. Amount of revenue does not necessarily equal amount of money spent even if the number is the same, depending on where you are as a company, i.e., amount of money in the bank, funded vs not, etc.